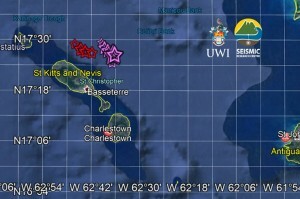 BASSETERRE - The Trinidad-based Seismic Research Centre (SRC) over the weekend reported a bust of more than 50 earthquakes occurring off St Kitts in less than 24 hours. In a brief statement issued on Saturday, the SRC which is based at the St Augustine Campus of the University of the West Indies, said that during the period December 6th, 4:28pm to December 7th, 9:50am, a burst of 54 earthquakes was registered. The events were in the magnitude range of 1.2 to 4.1. However, the SRC said there were “no felt reports thus far”. The centre’s head, Dr Joan Lutchman told a radio programme this morning that several tremors have been recorded since. “These events are shallow. We had an additional 12 earthquakes over the weekend. Overnight, through Saturday and into Sunday morning, I imagine there were even fewer, which is what you expect when you have a subsiding sequence,” she said. Dr Latchman warned the region that a “big one is coming and it is better to be prepared”.